We have so much running around to do today. Dustin is off today and we have to prep for his three week trip since he'll be working 10 hour days until he leaves this coming weekend. I'm so sad about this whole thing! 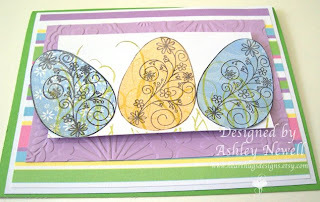 Anyhow, this is an Easter card I made. It's a bit like one that I've already made but I wanted to try the grass on top of the eggs this time to make it look like they were hiding. Also, I painted Shimmerz Blingz on these eggs to make them sparkle. Hope you all have a great day! Oh, I have more exciting news! I was chosen to be a Showgirl for the next VSN. Join us on Saturday March 28th for the first VSN mini for this season! YAY! Another great Easter card!! Love it! This is so cute and love the eggs. Ashley I love this card! :) Definitely perfect for Easter! yay on being a VSN hostess!! Sorry Dustin is leaving for a little while, but you know I am here if you need anything! Beautiful card!! Congrats on being chosen as a VSN showgirl, I'll try to do your challenge along with Shannon's. Sounds like a lot of fun. Such a pretty card! And congrats on VSN! Cute eggs!!! And I've been meaning to reply to you - I think I maybe saw it on FB about your DH being gone for 3 weeks. I can COMPLETELY relate, when I was pregnant with Courtney, my DH had to travel to Korea a lot. It was TOUGH, being pregnant is so tiring. My best advice though is to have activities in mind to help where Brady out. Playdates are key! I had friends come over for dinner a couple times too (although nothing that caused it MORE stressful for me - good friends and easy dinners). :-) Anyway I'm sure you know all of this. But just wanted to let you know I'm thinking of you, hang in there!!! I am so excited for you about VSN I have not come to one yet but I have got to come check it out!!!! I totally feel for you on Dustin being gone!!!! My Hubby has not been gone that long but he will be gone for 10 days in April and takes lots of small trips plus during Harvest he works like 18 hour days for a month straight which feels like he is gone for a month so I so feel for you it is so hard when you are pregnant to be by yourself for so long!!!! Please let me know if there is anything at all I can do for you during that time!!! Not that I can do much for ya from Kansas, but I will if I can!!!! I love the Easter Eggs they are so cute and I love the whole card!! !